These are some interesting looking Antique Icons! These quirky looking Engravings are from an 1880’s Jewelry Catalog. They are old Heraldry type images. 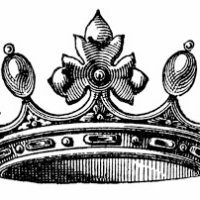 Included are a Queenly looking Woman, inside of a Crown, 3 Arrows bound with a Star, and a funny looking Bird holding a Snake! I really love these Free Vintage Images, and I’ll be curious to see what kind of projects you guys come up with for them! 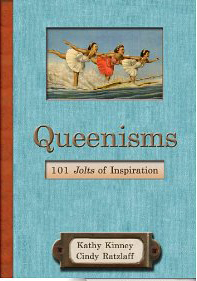 And speaking of Queenly women, my friends Kathy Kinney and Cindy Ratzlaff, from Queen of your Own Life, have come up with a wonderful new Ebook called Queenisms – 101 Jolts of Inspiration! You can find it on their blog, be sure and check it out! My favorite is lady on top of crown, thanks again for great images. Hope the new year is treating you right. Seeing as these are from the 1800s, I’m assuming its safe to assume they are royalty free and can be used freely? Thanks for digging them up! With some slight modification, my company is using the bird with the snake as its logo. I hope this is okay.